On Dec. 15, 1939, "Gone With the Wind" premiered in Atlanta at Loew's Grand Theater. It was one of the most momentous occasions in Atlanta history — a star-studded gala with Vivien Leigh, Clark Cable and Olivia de Havilland. But there were some key players missing from the premiere, including Hattie McDaniel, who played Mammy (the first African-American actor to win an Oscar), and Butterfly McQueen, who played Prissy. Matthew Bernstein, professor and chair of film and media studies at Emory, will discuss how the premiere's segregated Southern location lead to fretful, fearful and complex negotiations between Hollywood companies and city leaders in his lecture " 'Selznick's March': 'The Gone with the Wind' Premiere in Atlanta" on Dec. 1 at 7:30 p.m. in White Hall 205. Just in time for the film's 75th anniversary, Bernstein's lecture will provide a detailed exploration, from Hollywood's point of view, of the difficulties involved in mounting this unprecedented extravaganza in a segregated Southern city. Emory will also host a free screening of the film on Saturday, Dec. 6, at 1 p.m. in White Hall, room 208. Below are portions of an interview with Matthew Bernstein about the premiere written by Alicia Dietrich for the Harry Ransom Center at the University of Texas at Austin earlier this year. December marks the 75th anniversary of the premiere of "Gone With the Wind" in Atlanta. Why, all these years later, does this film evoke such a strong response from audiences? The hold "Gone With the Wind" has over certain audiences is extraordinary. I've known people who moved to Atlanta because of it, and I know people here in Atlanta take great offense if one mounts any criticism of it. There are many reasons for it. Some are obvious: its landmark status as an Academy Award winner and one of the highest grossing films, adjusted for inflation, in Hollywood history. There is its technical achievement as an extremely well made and spectacular film in one of Hollywood's strongest years — it's simply a great pleasure to watch. There are the terrific casting and performances by the leads and the secondary cast. But the film has such a hold over audiences for other reasons as well. The film's ambivalent treatment of Scarlett is one — she is a modern, brash woman in a genteel society who flouts convention to get what she wants however she can, with little introspection. The film admires her energy and drive, but simultaneously mocks her selfishness, her pettiness and her pretensions, largely through Rhett Butler's witty and clear-eyed deflation of her airs. She's a classic melodramatic heroine, one who makes so many mistakes in her life and loves and ultimately comes to realize the opportunities she has missed. Its deepest appeal, I believe, resides in its portrayal of the tremendous loss and suffering Scarlett endures — the film was a source of inspiration to women struggling through the Great Depression and then World War II across the globe. That portrait endures, even as it is woven into the less-than-progressive racial politics typical of the plantation genre of the 1930s (an area where we should note the film is less offensive than Margaret Mitchell's novel). You spent some time in the Ransom Center's David O. Selznick archive researching the premiere in Atlanta. What surprises did you find? The Ransom Center has always been one of my favorite places to undertake research. The Selznick collection is exceptional, and I found many surprises. One might have predicted the amount of work and energy that went into staging the premiere, but it was still extraordinary to see the details that had to be attended to. Selznick let his staff plan away, swooping in only at the end to question and in some cases criticize their work. Another big surprise was a letter I found from one Robert Willis, a member of a theater club on one of Atlanta's black college campuses; this student invited the Selznick group to visit the black side of the city. No one to my knowledge had discussed this aspect of the premiere. I had read Selznick's last-minute memos about giving Hattie McDaniel a page in the souvenir program for the premiere, but never knew what inspired that. Overall, the most delightful surprise to me was to see the extent to which Margaret Mitchell had Selznick wrapped around her finger. The dynamic there is extremely amusing. Selznick and his staff worked for months to plan and execute the premiere in Atlanta. Can you talk about why expectations were so high for the film in Atlanta? As I mentioned, Selznick was not really involved in the plans. He was far too busy attending to the manifold details involved in "Gone With the Wind's" post-production so that the film would be finished in time for the Atlanta premiere. He delegated the overwhelming majority of the work to his story editor, Kay Brown, who worked with Atlantans as well as the MGM distribution executives in charge of the premiere. Selznick fretted on the sidelines, gave Brown some ideas, but his attention was elsewhere until late November. As for high expectations, in the 1930s, the white citizens of Atlanta craved attention and validation, partly because of the city's destruction during the Civil War, and partly because of its boosterism. It was a growing city that loomed large regionally, but not nationally. To have one of its residents write a Pulitzer Prize-winning international bestseller stirred a wave of civic pride. Atlanta also loved the movies as much as any city in the 1930s, but not many films were set in Georgia. So Georgians were thrilled at the prospect of seeing an epic production that was sympathetic to the state's ordeal during the Civil War and afterwards. Southerners in general felt Hollywood never represented them fairly — here was a film that promised to do so. Add to that the idea that Clark Gable and Vivien Leigh would be on the streets of the city for the premiere and you can see why white Atlantans — officials, business leaders, civic leaders and ordinary citizens — went crazy over this. White Atlantans, that is. Black Atlanta likewise gloried in the presence of the stars, but some leaders questioned the hoopla and the film itself. There were controversies over race with the premiere in Atlanta, as producers deemed it unsafe for Hattie McDaniel to attend the event and African American audiences were largely excluded from festivities taking place around the city. Can you talk about how Selznick and his staff approached these issues? 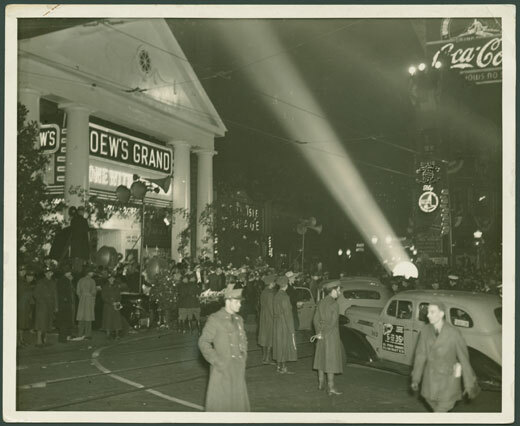 The Loews' Grand where the premiere took place did not have segregated seating. Black Atlantans waited four months until April to see it in a "colored" theater. Selznick recognized that his film could invite strong attendance among African Americans, and even thought that if black cast members came to Atlanta, they could help promote the film in black neighborhoods. Kay Brown, like the MGM distribution and advertising executives who planned the premiere, relied heavily on certain Atlantans for advice on many issues, including this one. The "Hollywoodians" knew they were way out of their depth on the "delicate" issue of race relations in the South. Most simply, they followed the advice the Atlantans gave them, which was not to include Hattie McDaniel in the festivities or the souvenir book. Regarding the latter, the rationale was that McDaniel's photo in the program might give some malcontent a basis for criticism of the film and the premiere, something they wanted to avoid. Besides, as guests of the city, the Hollywood folks thought they should follow their hosts' suggestions. Kay Brown put it well: "…while it was unfortunate to exclude Mammy, it was the wisest policy." They made an unsurprising choice in 1939.